Food events offer a great opportunity to meet partners, buyers, customers and more, see the latest products, network and gain valuable market insights. The Froghop team will be at many of these UK food events, so if you’d like to discuss the possibilities for your product, just contact us. A “celebration of 1,350 innovative, global and cutting-edge food & drink manufacturers” this event gives British and international suppliers the opportunity to meet and connect with top retail, wholesale and distribution, import and export and foodservice and hospitality buyers all under one roof. What’s more, this is a joint-event with Pro2Pac, the food & drink processing & packaging event, making it a must attend event for food producers. The event for natural, organic, Fairtrade, free-from, vegan, and vegetarian brands. Over 700 exhibiting companies will be complemented with a packed programme of expert seminars (over 70 industry speakers) and live cooking demonstrations. Like last year, The Ingredients Show will run alongside the Farm Shop & Deli Show (below) over the course of three days. The guest list is still growing but in 2018 there were over 1,500 exhibitors and 250 speakers in attendance. The event allows visitors to “take a deep-dive into what’s driving the industry right now, from novel ingredients to sustainability, fresh tastes and the latest consumer trends.” It also offers an opportunity to network, get practical tips and learn about maximising your productivity. This award-winning, specialist retail event runs alongside The Ingredients Show so you can kill two birds with one convenient stone. It promises to showcase quality local and regional produce, “plus the latest in equipment, labelling and packaging solutions”. More than 450 suppliers will offer samples and answer questions, alongside market analysts and journalists offering their insights. A buyer-focused show, this event will be hosted by a leading independent buying group, Associated Independent Stores (AIS) and is designed specifically (and exclusively) for independent retailers. It will offer buyers “everything they need to complete their Autumn, Winter and festive food and gift buying” with exhibitors featuring Gift Food, Home Fragrance, Cards & Wrap, Confectionery and Speciality Drinks. The show is anticipating over 70 exhibitors, giving visitors access to 100s of brands. The “essential industry event for kitchen innovations” has plenty to offer those looking for the best kitchen equipment, services and accessories. It claims to be a one-stop-shop covering all sectors of the diverse foodservice industry. Your ticket will give you access to keynote seminars from the industry’s leading names. Like last year, there will be an award gallery and you can vote on your favourite innovation. The 2019 programme will be announced in Spring 2019. The always popular BBC Good Food Show is back for its big summer event, packed with seasonal produce, the UK’s top chefs cooking live and a plethora of exhibitors and producers. Plus your ticket includes free entry to BBC Gardeners’ World Live, providing a variety of seed-to-plate inspiration. Every year, the show awards “the most outstanding British producers we can find” with a bursary to attend one of the BBC Good Food Shows. The campaign calls for applications from small, independent producers with companies shortlisted at the BBC Good Food Test Kitchens by a team of experts. The winners win the opportunity to exhibit free of charge – entries for Winter 2019 and Summer 2020 will open soon. Taste of London is the definitive showcase of the capital’s best restaurants, top chefs and leading food and drink brands. Last year 50,000 visitors attended. It promises to be a vibrant event of the foodie calendar, with a festival vibe as the movers and shakers of London’s restaurants serve up taster sized signature dishes, world-class chefs cook on stage and there are over 200 purveyors of food and drink. Claiming to be “the world’s largest celebration of ‘free from’ food, drink and lifestyle products” this three-day event is a great opportunity for free-from food producers to gain brand advocates, data and sell to a large, focused audience. Meet over 700 producers and suppliers of artisan food and drink, explore 200 new products in the discovery zone and see all 50 great taste awards finalists displayed under one roof. For the food-to-go industry, lunch! is the leading trade show featuring over 370 exhibitors, industry-leading speakers and over 6000 visitors. Here you’ll find thousands of new products and opportunities to network. This annual two-day conference “and bootcamp” for emerging and growing food and drink brands brings together food and drink founders, innovators, investors, media and industry leaders so you can expect a ground-breaking programme of panel discussions, inspirational keynotes, hands-on workshops and mentoring sessions focused on “accelerating independent food and drink brands with bold aspirations”. Although their website is under construction, the holding page has two dates (below) and in previous years this show has offered tools, expertise and contacts to help café or coffee businesses. Features have included a seminar programme, workshops, coffee tasting, interactive demonstrations and a popular Latte Art Competition. If you can’t make July’s show in London, or you prefer a more northern venue, this one is for you. This one is a shorter event but still a good opportunity for free-from food producers. Bellavita is the biggest artisan Italian food and beverage trade show outside of Italy. The B2B Expo is dedicated to promoting the delicacies of Italy through ten international trade shows. Those in Europe include: Amsterdam, Warsaw, Parma, Hamburg and London. The first this year will take place in Warsaw with over 400 exhibitors and 6,000 professionals from across East-Central Europe in attendance. An exclusive B2B trade event, EPPS unites leading UK and European food wholesalers and retailers, pizza operators and pizzeria owners, restaurant chains and independent restaurants, hotels and catering companies with equipment manufacturers, specialist ingredients and food product suppliers and service providers. The event attracts over 150 exhibitors and over 3,000 attendees. Food Matters Live returns to ExCeL, London on 19–20 November 2019. Hundreds of exhibitors will be joined by 250 industry experts, across six curated seminar programmes, and 50 influential speakers, and thousands of visitors from across the global food and drink industry. This is a unique event focused on the future of food, drink and sustainable nutrition. 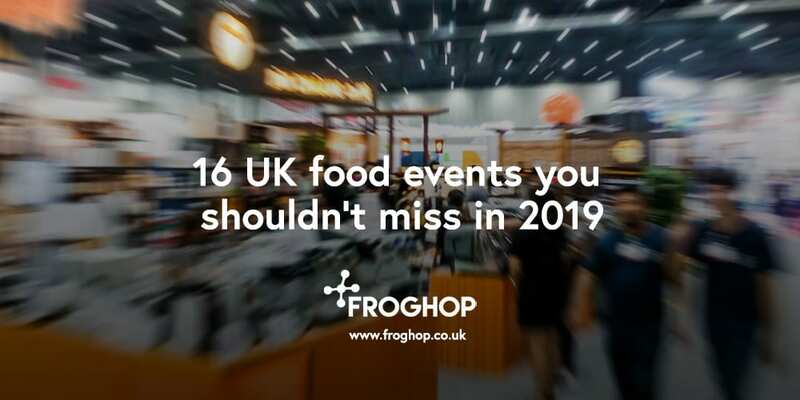 The Froghop team will be at many of these UK food events, so if you’d like to discuss your product or just connect, contact us.